This project was not planned. I was in fact in Lowes (where else would I be!?!) looking for some trim for a DIY mirror project (more on that soon) when I came across some 1/4 thick trim. It made me think of several pins I’d come across on Pinterest. Without even as much as measurements, I bought 15 pieces of the 1/4 trim and took it home. I had originally got several quotes to replace these doors, but since they were custom-made to begin with (because of their 5 ft non standard height) new doors were going to set me back close to $400. YIKES! Definitely not happening. 1. Cut lengths of the trim to match the length of your door. Using wood glue and some brad nails, secure these vertical strips in place. 2. Measure the distance between the two length-wise piece. This is the measurement you’ll need for the horizontal pieces. 3. Decide how many square/rectangle “panels” you want on each door. If you’re really smart, you would do some math here. I was too lazy and just eyeballed where I wanted them to go. 5. Use wood filler or some caulk to fill in any spaces that you may have. 6. Sand down the caulked areas if necessary. Paint with two coats of primer (I used Benjamin Moore Fresh Start primer). Let dry for 24 hours. Then paint with a semi-gloss white paint. 8. If you are not good at installing door hardware, make yourself a template using painters tape. Put the tape on the hardware and punch through the holes with a pencil – instant template! 9. Drill from the outside of the door to prevent the wood from splintering. 10. Sit back and enjoy your new closet doors! I guess I need to get to work on those too! *UPDATE* If you enjoyed this post, check out how I converted my bedroom closet bi-folds to french doors! Can the trim pieces be easily cut to size with a hand saw? I don’t have a power saw. Wondering if I could get clean, even cuts with a hand saw. Hi! 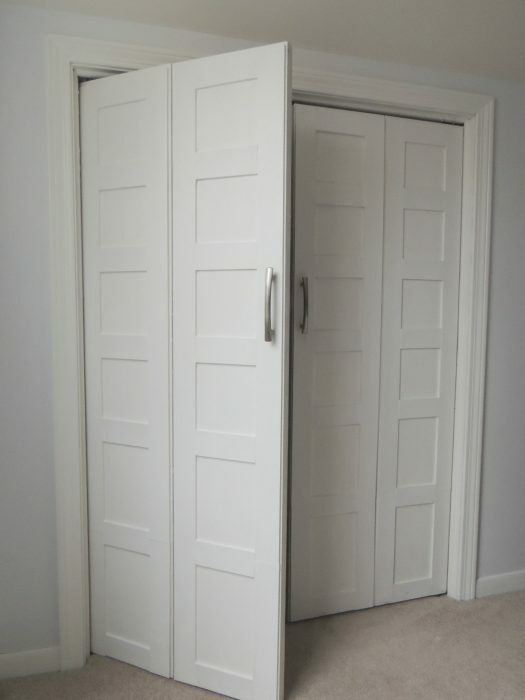 What a great idea for the closet door “upgrade.” I am looking for those 1/4″ wood trim pieces and Lowe’s and Home Depot online leads me nowhere. What section of Lowe’s would I find these? Another name for them perhaps? I tried “1/4″ thick wood trim”, “wood edging” “picture frame trim” and I used their chat offering and no one came up with anything! Any suggestions? At my local Lowes they are in the wood section (with all the 1x2s, etc) but located on shelves underneath. They are easy to miss! They are usually called “craft wood” or “lattice wood”. I believe if you search “wood lattice moulding” on the Lowes website it will come up. I hope that helps! I looooove this! Such a great idea! I’m pinning it so when we are not renting anymore I can use it. Ooooo, I love this. I’m going to try this but I’m curious what is the total width of your closet opening? My closet opening looks wider, which would make for bigger doors. I’m concerned it would look awkward. Menards makes double doors that are 72″ inches wide (each door being 36″) so maybe it will work, I just want to compare with your picture. Thanks! Hi Jenna! I work with Cassity over at Remodelaholic.com, and we would love to feature you and your closet facelift! I couldn’t find an email address to contact you at, so if you’re interested, just drop me a line at hello@remodelaholic.com and we’ll discuss the details. Thanks! love this look, now that you have had them a while have you had any issues? does the added weight interfere with how the doors function? Thanks Amanda! Nope, I’ve had no issues…the wood is so light you wouldn’t notice the difference! Love how your closet doors now look like paneled doors! Pinned and sharing on fb, great project. I agree with everyone else. You are really talented to be able to do this by yourself. Me? I have the vision with no flow through expertise. Luckily I’m married to a handy guy that is Mike Holmes’ good! Haha. I see=he makes it happen. Win win. I have to give you props…I wouldn’t have even given the boards at Lowes a second glance! Gorgeous project. *golf clap*. Lol. Amy you’re so sweet! If I had a Mike Holmes-type husband I would be in heaven! haha My Dad is an engineer, so I’m assuming that where I get my genes from! Beautiful! Do you mind sharing how much the wood cost? 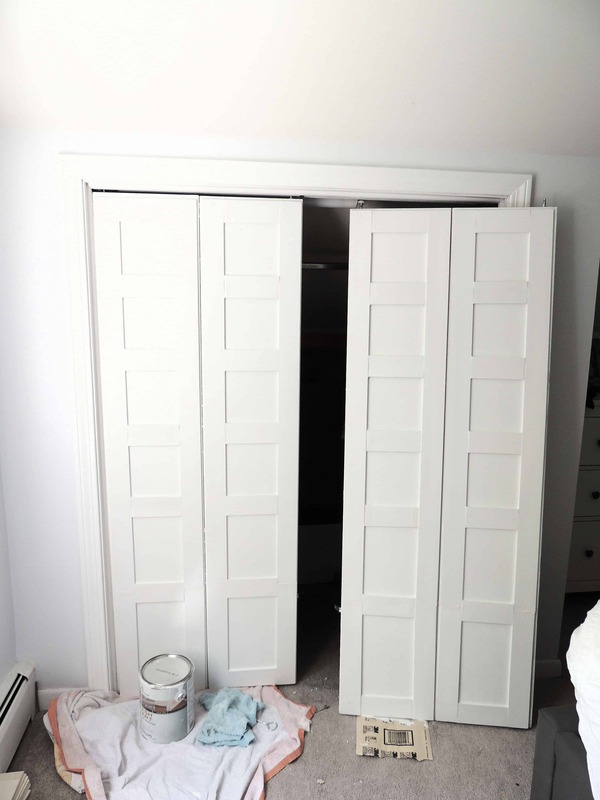 I’m wanting to swap out some doors for these kind and I’m wondering if it’s cheaper to buy the cheap-o doors and upgrade them DIY style or if I’d be better off buying the ones that come like this. The wood was 99c for about 3 foot. I think I spent about $30 in total including the hardware for the door. The issue with my bi-folds is that they were custom made for the room so I can’t easily replace them! these turned out great, what a terrific idea! That looks great! What a fancy facelift!